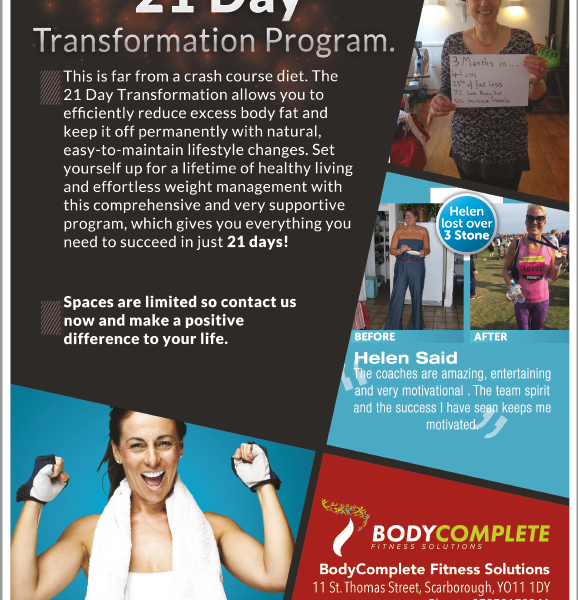 TRANSFORM YOURSELF IN 21 DAYS! The 21 Day Transformation is a way of life designed to eliminate the harmful processed foods and high-stress behaviours of hectic modern life. Instead we believe in getting back to basics. During your 21 Day Transformation, you will learn how to put your bodies’ balance back to its preferred role of using fat for fuel. Instead of riding the vicious cycle of fat-storage, inflammation-promoting effects of today’s grain & high-carbohydrate diets. We will teach you how to avoid the easy pit falls when it comes to exercise that lead us to fatigue, injury and burnout. We will provide you with a blend of metabolic conditioning exercises that will compliment your everyday movement, with regular high-intensity strength sessions with a sprinkling of speed. Your body and mind will become refreshed with the help of the correct amount of sleep, nutrition and exercise. I must stress this is far from a crash course diet. The 21 Day Transformation allows you to efficiently reduce excess body fat and keep it off permanently with natural, easy-to-maintain lifestyle changes. Set yourself up for a lifetime of healthy living and effortless weight management with this intensive, comprehensive and very supportive program, which gives you everything you need to succeed in just 21 days! We embrace these values and take them very seriously, which is why we are 100% confident to say that if you commit to the program you will see yourself transform forever. Take that difficult but rewarding step, take on the challenge and transform your health and improve your life for good. If you still aren’t convinced please read our current client’s testimonials on our website for their success stories. It’s a way to figure out what makes your body tick, a method for rejuvenating your health and revitalizing your metabolism. But most importantly it guides you to a place that lets you have the power to control your health, reduce your fat percentage, increase muscle mass, energy producing, and life-extending pathways. “The difference between who you are and who you want to be is what you do”. The importance of ‘what you do’ is key to the whole transformation. What we don’t expect is for you to do it on your own. Our team of professionals will make sure you are supported, guided and made accountable every step of the way. We pride ourselves on looking after our members and you will be no exception. 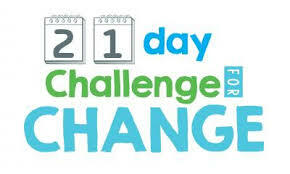 Is your body, health, fitness and how you feel about yourself worth the commitment for just 21 days? I hope the answer is a big YES! If it is, or if you are still not sure, and would like a bit more information please call us on 07970170241. I promise you will not regret it. 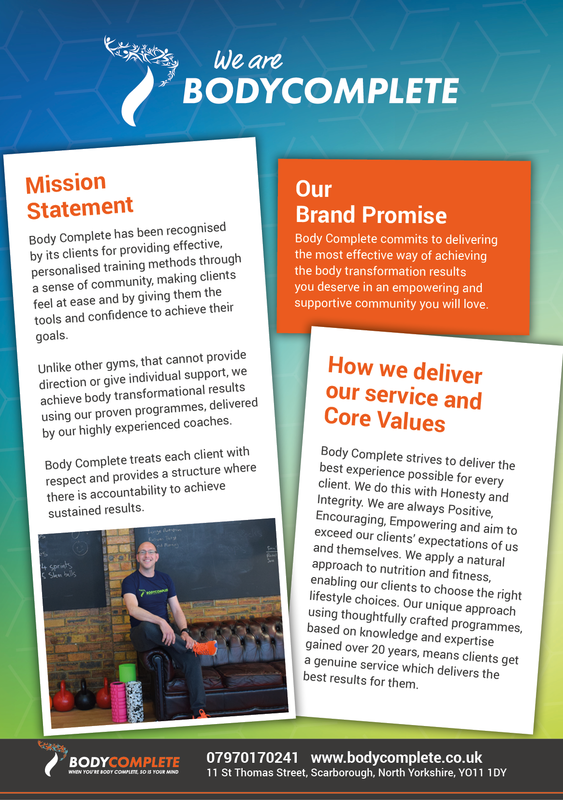 Who Are Body Complete Fitness Solutions? Realise the true balance of a healthy body and happy mind. Sounds like an easy way to rejuvenate your health and revitalize your metabolism? It is….. Get inspired and act now!